Bad Grades in College: 3 Reasons Students Get Them | Go From Stress To Success! These are common questions that parents often ask their first-year college student when their college grades slip from their high-school 4.0s. And while it’s understandable to react that way, it’s both damaging and counterproductive – counterproductive, because these kinds of questions generally bring rejection and apathy from the student, and damaging, because it harms the student’s ability to succeed later. So what’s a parent supposed to do when their student comes home with less-than-stellar grades? Bad grades in college, from the outside, look like a failure of effort, willpower, and responsibility. Westerners tend to put a lot of emphasis on individual achievement and individual effort. We also tend to insist on holding individuals personally responsible for every outcome, and we assume that their outcomes are always the result of their deliberate, conscious choices. We may not say it that way, but our reactions to bad news or bad results speak louder than our words. When we’re confronted with an opposing view, many of us tend to push back rather than examine our assumptions. Parents of college and high school students are not an exception to this rule. After some discussion, it became clear that her objection centered around the idea that allowing a D to be an acceptable grade was the same as saying “it’s okay if you don’t try hard” or “it’s okay to get bad grades in college.” But that’s an assumption she was making, and it’s the reason why she didn’t understand the article at first. The assumption is this: In Western culture, we tend to assume that if you work hard, a good outcome is inevitable – but it’s not. We also tend to assume that if you don’t succeed, you just didn’t work hard enough – and that’s not true either. We have hundreds of examples of the business that didn’t succeed even though the owner was running themselves into the ground. Students – and their parents – seek out academic coaching for a lot of reasons, but one of the main ones is grades, especially with late high-school and early college students. Many people aren’t aware that straight-A students often become straight-C (or worse!) students in their first year of college, and the plummet in their grades prompts a search for tutoring, coaching, and other academic help. The slip in grades often raises feelings of shame and guilt in the student, and confusion in the parent. Parents’ concerns can come across as shaming or a guilt trip, and then students internalize the grade as a label of their self-worth, competency, or intelligence. This is a bad road to go down, but too many people follow it. Why? Because we assume that it’s all about the student not trying hard enough. 1. The student is simply not ready for the course material yet. Maybe they’re missing some crucial background or prerequisite – a student who has not yet taken algebra will not do well in a calculus course; a student who still needs help with spelling and grammar isn’t going to do well in college English. Maybe they still need a skill set to manage the demands of the course material – time management or organization may not be something they’re good at, yet. But whatever the reason, a student who isn’t ready for a course’s material due to maturity, skill levels, or prior knowledge sets will not do as well in a course no matter how hard they try. Expecting an A from a student when they’re in over their head in a course is like expecting a person who’s never done anything beyond walking to run a marathon without any training or preparation. It’s unrealistic. 2. The student is overcommitted or overwhelmed. This happens a lot in high school and college. A few semesters ago, I had a student who admitted to me that in addition to their one-class-beyond-full-time-load at our school, they were also taking four other classes at two community colleges and working a full-time job while having a family at home! As a coach, I’ve also had students who are trying to take their full class load (with AP classes), two extracurricular activities, and different lessons (such as piano lessons or karate) every day of the week. In that situation, it’s not surprising that something has to give somewhere. There are, after all, only 24 hours in the day, and in addition to their classes, students have other obligations such as work, sleep, meals, and laundry. And even the student who “only” has a regular course load may be overwhelmed – one size does not fit all when it comes to how long things take. Student doesn’t care —> student doesn’t do the work —> student fails the course. Student is not ready for the course material —> student tries but fails because they are not ready for the course material —> student gives up and stops caring. Student is overcommitted or overwhelmed —> student has to let go of something, so they let go of this class or classes —> student fails because they have too much on their plate —> student gives up and stops caring. As a coach, I find that talking to the student about why they’re not doing well (or not doing as well as they used to, or not doing as well as they want to) usually reveals reasons that fall into groups 1 and 2. They are in over their head, but they’ve always been “smart” before and now they feel like they’re “stupid.” Or the work was always easy before (because they’re “smart”), and they don’t have the study skills they need to pass a course in Biochemistry (yet), and they’re ashamed to ask for help. 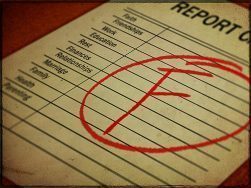 What can parents do for their students to make it less difficult when the inevitable B, C, or D shows up on their grade record? Three things, actually. First, reassure the student that this is not going to be an issue of disappointing Mom and Dad, or that they’ll be told they’re a bad person or a failure. Get the conversation about “what happened,” instead of “what did the student do or not do here.” Before you can talk about solutions, you have to identify the problem. Second, ask the student what’s been going on in their school and personal life in the last few months. Ask them what’s going well, what’s stressing them out – even what’s annoying them. Give them time to answer. They may not tell you everything. Even so, just asking the question can get them to reflect on what’s been stressing them out, blocking them from success, or making life impossible. Remember, knowing is half the battle. Finally, once the student has presented you with some of the issues they’re dealing with, decide where those fall. Are they Group 1 problems, where the student isn’t ready for that course (for whatever reason)? Are they in Group 2, where the student is overcommitted or overwhelmed? Or has the student already moved into Group 3, where they have just run out of reasons to care about that course (or worse yet, about school in general)? Don’t worry – there are solutions! Group 1 problems – get a tutor for problems with individual classes, or an academic coach if the problem is more generalized and affecting more than one or two classes. Group 2 problems – help the student identify what they can or should let go of. If they’re living at home and you’re still depending on them to do 50% of the housework, maybe it’s time to delegate doing dishes or taking out the trash to a younger sibling. If they’re trying to work at a full-time job, help them understand that a full-time course load may be counterproductive. Research possible solutions to being overcommitted: If they’re at a four-year school, can they take a leave of absence for a couple of semesters and take some of their general-education classes at a community college, where the cost is lower? Group 3 problems are the toughest. You can’t make someone care about something if they have already given up. If that’s already happened, explore counseling. If the apathy and rejection are extreme, you may need to let the student walk away from being a student for a while, or even permanently. They may be a late bloomer! Or, they may be more temperamentally suited for a job that’s important, but does not require a college degree. As an example, my parents both had college degrees, but I crashed and burned when I went to college. I had always been a “smart” student, but I was not mature enough to do college-level work. I also didn’t have the study skills, because I’d never had to try very hard to succeed before, and now the demands were overwhelming. Essentially, I was a combination of Group 1 and Group 2, and that drove me into Group 3. I dropped out of college at 19, got married, got a job, and worked in the “real world” for over 10 years. Then I considered going back to college. Over the next 11 years, I acquired two associates’ degrees, a bachelor’s, a master’s and finally a doctorate. I’m a late bloomer, but college was much less stressful for me in my thirties than it had been in my late teens. This is the place where parents often balk and resist the solution, because they had a dream for their child’s future. Dreams are great, and they can motivate, but once that child is an adult, you must allow them the space to make their own decisions (and mistakes). Be there for them, and be supportive, but remember that you cannot force someone to care. Give them a gap year before they go off to college,if this not-caring happened in high school. Let them experience the world without the demands of grades, coursework, and exams. They may eventually return to college when they’re ready for it – and it has to be okay if they don’t. So you’ve figured out what blocked your student from the better grade, and you’ve offered them what help you can. Now what? Now you let it go. Believe me, I get it. I know some of you are getting ready to make angry comments on this blog post, because letting go can be really hard for some parents. Most of us are invested in our child’s success, and some of us see the child’s successes or failures as a reflection on our parenting skills. But if your goal is to raise a functional adult, at some point you must let them make their own mistakes and their own decisions, or they’re not an adult – they’re just an extension of you. So let it – and them – go. Letting go of the assumption that “success is all about individual effort” will help your student more than you know, both in the short term and the long term. Once you’ve done what you can to help your student deal with not being ready yet, being overcommitted, or just plain not caring, let it go. Yes, your child has great potential and they’re destined for a bright future. It’s still important to accept that it may not be the future you envisioned when you first held them in your arms. And don’t let their grades become a reflection of their worth – either for you, or for them. Want some help figuring out what might be making your grades slip? Click here for a free list of things to check! Posted in Grades, Parents and tagged bad grades, blog, college grades, college stressors, college students, for parents, grades.